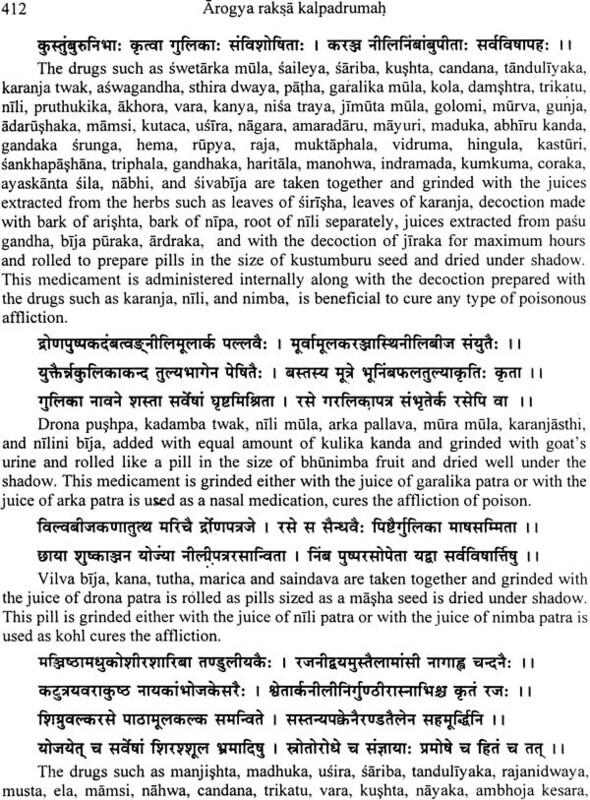 Arogya Raksa Kalpadrumah, is a laudable literary source on specialty Ayurvedic pediatric care of Kerala terrain. Sri. Kaikkulangara Rama Warrier, one of the illustrious astute of ancient Kerala, is considered as the author of this treasured literature. 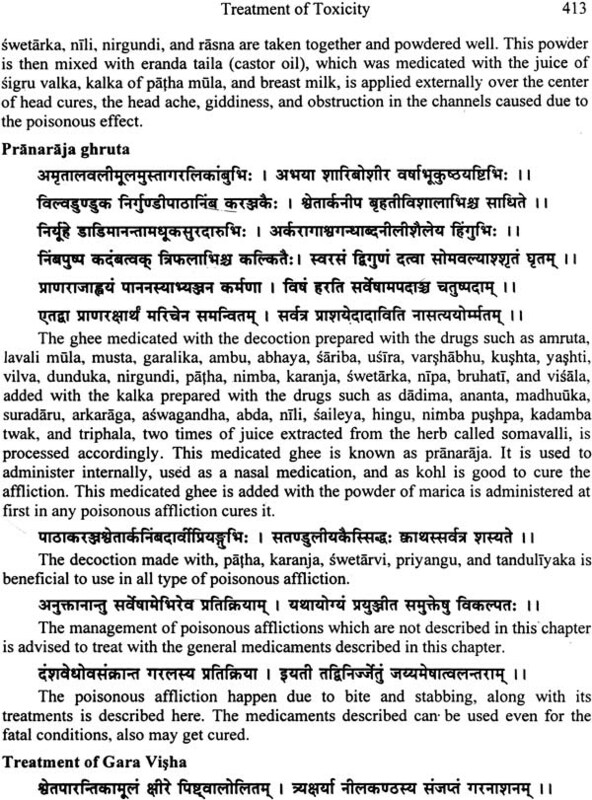 This literary work contains exceptional information regarding various diseases pathogenesis and its management, with reference to pediatric age group, which is not seen any of the other Ayurvedic literary works. A sumptuous explanation of 51 types of visarpa (inflammatory skin diseases) etiology, pathogenesis and its management is explicatively explained in this book is its outstanding feature. Apart from this topic, various other disease pathogenesis and its management, such as Rakta stambha, kundalaka, sakha roga, Nabhi roga etc. are explained in this work. 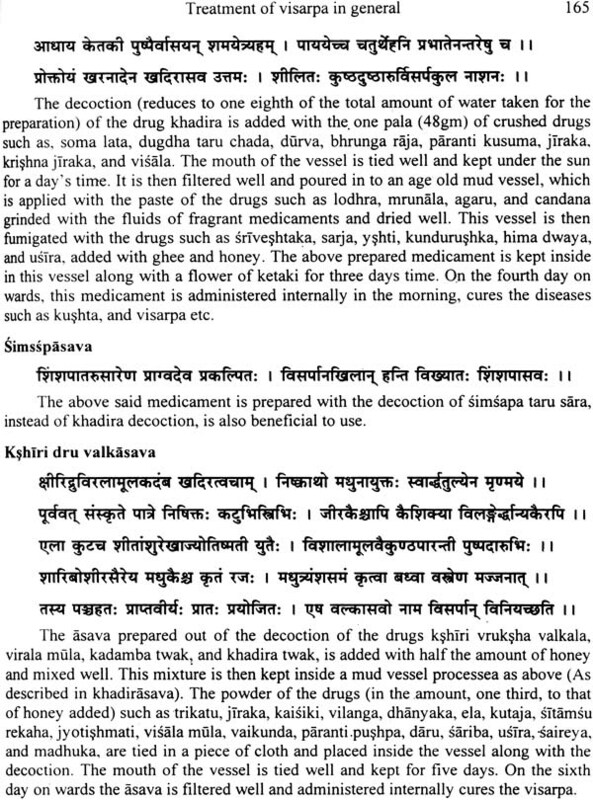 This is another special feature not seen in any of the other Ayurvedic literary works present today. Another topic of special citation is that, is the lucid explanation on immunomodulatory methods followed in children, is explained under the topic as prakaradi yoga, is a specially of this book. 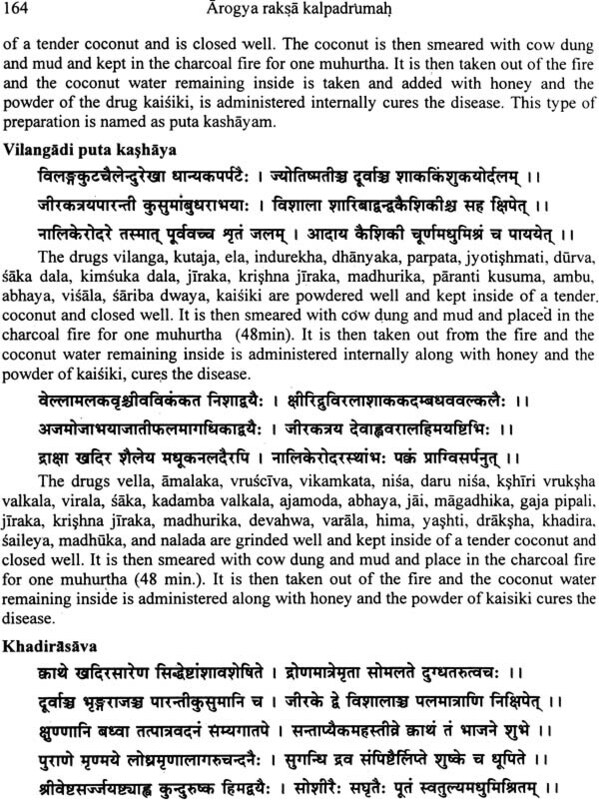 Aside from all the above, Arogya Raksa Kalpadruma explains the innards of all the eight specially division of Ayurveda. 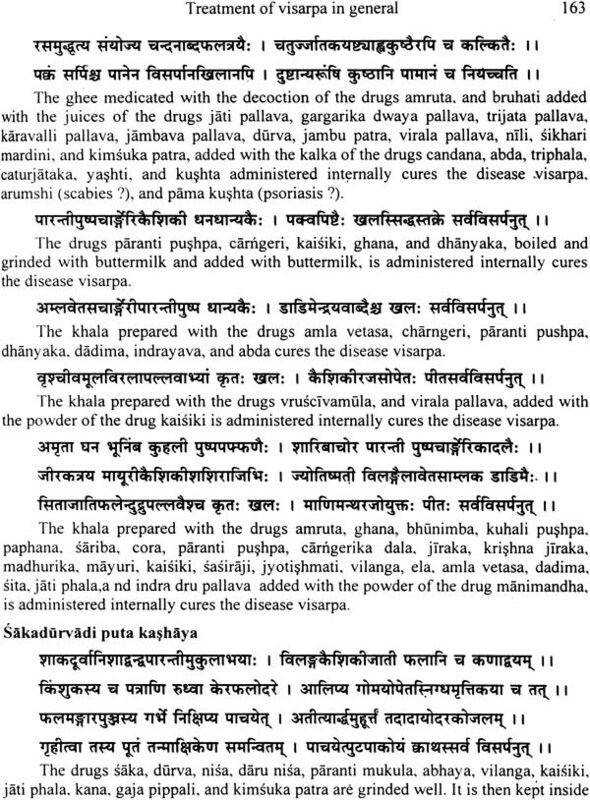 On rummaging the heirloom of Kerala's splendid Ayurvedic health care treasures, one can find, Arogya Raksa Kalpadruma, is the bible of the ancient Ayurvedic pediatric health care wisdom of Kerala. Dr. Lal Krishan is a known Ayurvedic scholar involved in various facets of ancient Indian life sciences and scientific wisdoms such as Ayurveda, Yoga, Tantra, Vastu, Kalari vidya (Kalarippayattu/the oriental martial art of Kerala) etc. in the course of his carrier he was contributed numerous articles on various subjects to many national and international journals and magazines. Dr. Lal Krishnan is the brainchild behind the world's first online electronic magazine on Ayurvedic science, was already proved its stand in the internet based knowledge gateway. Born on May, 8, 1978, in Kerala, for Sri, K. N. Krishnan and Srimati. M. N. Omana, Dr. Lal Krishnan was graduated from Sri Jayendra Saraswathi Ayurvedic College, Nazarathpet, Chennai, in the year 2001. Dr. Liji Krishnan is his sister, is also an Ayurvedic physician practicing in Kerala. Wife, Radhika M. is a notable personality in the field of Kalarippayattu (the oriental martial art of Kerala) and a well recognized chiropractor. Dr. Lal Krishnan has got his valuable training in Ayurveda and other allied subjects with various scholars such as, Sri. Ashtavaidyan Vaidyamadhom Cheriya Narayanan Namboothiri (Vaidyamadhom Vaidyasala and Nursing Home, Mezhathur Palakkad), Sri Gangadharan Vaidyan (C. N. S. Bala chikitsalayam, Mezhathur, Palakkad), Veera-sri. Sami Gurukkal (Hindustan Kalari Sangam, Puthiyara, Kozhikod), are few among many. Ayurveda, the ancient Indian bioscience depicts all the aspects of a healthy living. A vast amount of literary resourses illustrates the knowledge about this science form. The divine insight of our ancient sage is the source of this knowledge stream. The entire concept, were branched out in to eight as, kaya chikitsa (internal medicine), salakya Tantra (head and neck disorders), salya Tantra (surgery), visha chikitsa (toxicology), bhuta vidya (supernatural medicine), koumara bhrutya (pediatric medicine), Rasayana (rejuvenant therapy), Vajikarana (virile therapy). Arogya raksha Kalpadruma is a valuable literary resource dealing with the pediatric care. This book has been compiled by a great scholar named, kaikulangara Rama Warrier, who lived in the Kerala terrain in the last century. 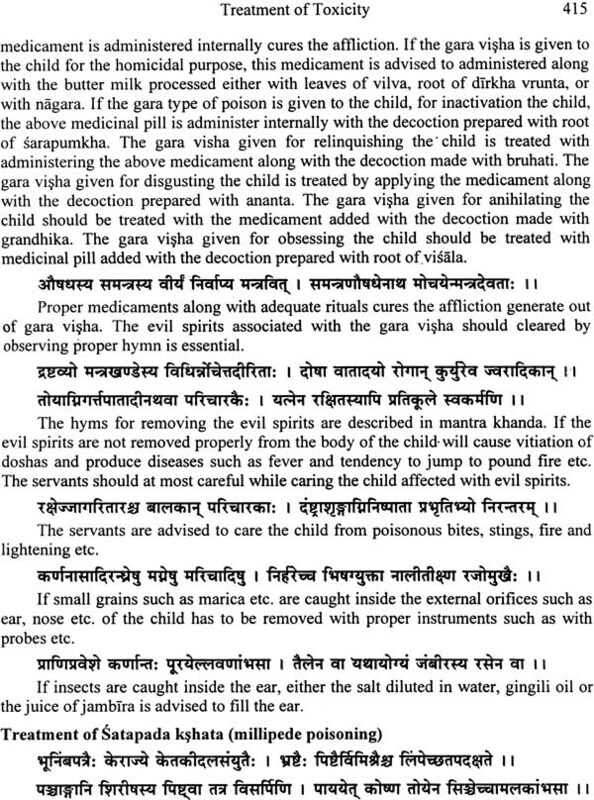 This literary resource is the one and only leading light in the ancient Kerala tradition of Ayurvedic pediatric care. 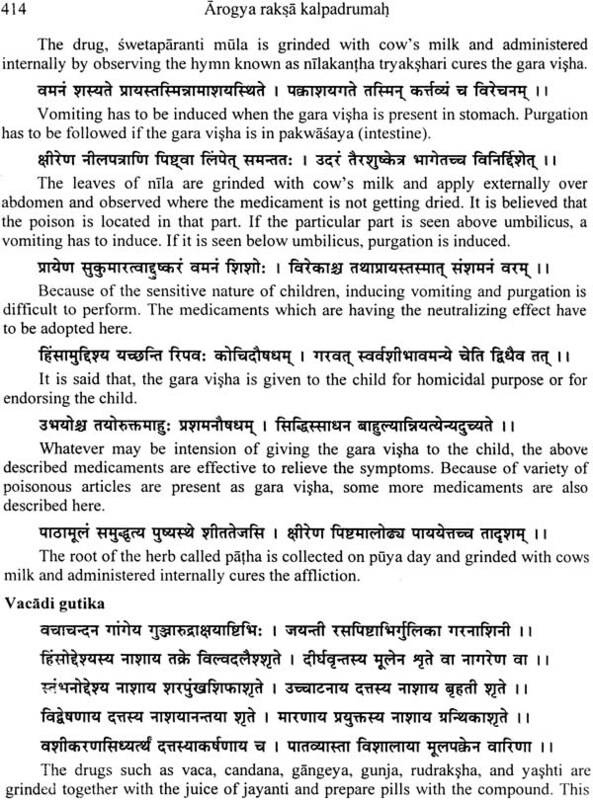 This work is considered as the valid source of Ayurvedic care of children. The narration contains the principles and practices regarding the varied aspects of a child care, starting from the newborn care. The facts regarding the spiritual and physical growth of a child is schematized in this book. A vast description regarding various diseases and its treatments are described in detail. As a special, this book comprises the vast description regarding the disease Visarpa; in detail. 51 types of Visarpa affliction with its diagnosis and treatments are described in this treatise. 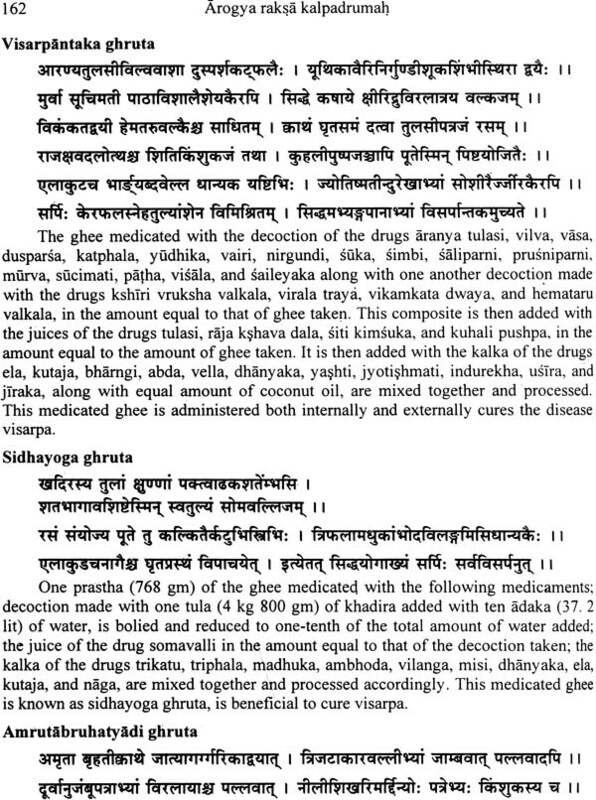 Many other disease modalities such as Rakta Sthambha, Raktanavastha, kundalaka, and sakha roga etc. are the special references found only in this treatise, shows the importance of this work. A separate chapter dealing the immunomodulatory measures s another reason for praising this compilation. Many varieties of therapeutic preparations are also described in this compilation. This is the first time in the history; this literature is getting its form in Devanagari script with an ample English description. I am very much grateful to the publishing authorities, the Chowkhambha Sanskrit Series, for their keen interest, which they shown regarding the publication of this work. At this moment I bear a celestial feeling in my mind regarding the wholehearted support, which I got from my parents and about the light of knowledge and wisdom shown by my guru especially, Sri ashtavaidyan Vaidya Madhom Cheriya narayanan, Vaidya Sri. Gangadharan nair, Sri. Sami Gurukkal, Dr. K. P. Muraleedharan, Dr. K. T. Jaya Krishnan, etc. are the few among them.